Let me begin by wishing all of the Dads out there a wonderful Father’s Day. Remember, if you influence the lives of children and are a part of their world you are a Father. A special thank you to TechyDad for being such a wonderful father to our boys. A girl never could have dreamed for such a wonderful man to be the Dad in our family. It has been amazing watching you over the years with the boys teaching them all things geeky, techy and beyond. I also hope that Papa, my brother, all of my uncles and my Cousin D had an extra special day. This weekend, we spent a lot of family time together doing fun things. On Saturday, we left in the early afternoon and went to Six Flags. This morning, we thought about going strawberry picking, but, thanks to a storm last night, we thought it may be too muddy and buggy. TechyDad decided that he would like to go out to lunch and then bowling. He thought it would be fun, cool inside and interesting since JSL has never been bowling before. After lunch out, we decided to try a new bowling place. For some strange reason, most of the bowling alleys in our area are closed on Sunday. 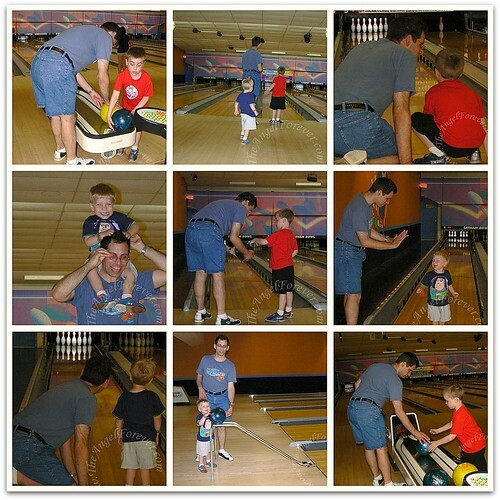 Here are some photos of the boys bowling together. More about Six Flags, bowling and what we signed up for this summer coming soon. Again, Happy Father’s Day to TechyDad and all of the other dads out there! What a wonderful way to spend a Father’s Day! Techy Dad is truly a great father and I am so happy that you shared these photos with us. We love and miss you!